Here at Koulen Restaurant, in Siem Reap, we have a range of different Traditional Khmer Dancing Shows starting at 7:30pm, every night of the week, every day of the year! Our show also includes the Coconut Shell Dance which is a homage to the cocunut trees that can be found all over Cambodia. It was created by artists from the Royal University of Fine Arts and presented during our shows! We also feature the Fish Harvest Dance which is inpired by the heavenly blessed earth and water! There is a saying in Cambodia that says: "Where there is water, there are fish". 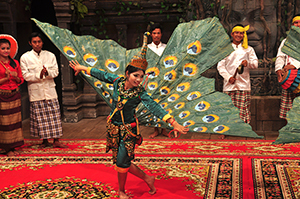 This dance brings the fishermen to the stage, recreating their fishing methods, equipment and even a courting scene!